several years ago it was decided by scottish water that they would renew all the sewerage piping running under flora street, main street and shore street, meaning lengthy bouts of digging up roads. the portent of all this activity led most of us to believe that there would be wide sections of these major arteries through the village upturned to cause trafic mayhem. in point of fact, only a thin sliver at the side of each street required to be excavated in order to drop some heavy-duty plastic piping into place and immeasurably enhance the village ablutions. it would be unfair to mention that this had to be suffered twice over after it was realised that a substantial length of this sewage piping was of an incorrect diameter, a folly only discovered during the latter stages of this industry, necessitating a further period of digging. so i'll say nothing about that bit. anyhoo, on the occasion of april 1st arriving prior to the commencement of roadworks, this fortuitous date coincided with the fortnightly publication of our local newspaper. not wishing to miss such an excellent opportunity, i inserted an article that attested to the twinning of bowmore with that of harelbeke in belgium. in order to make this more of a permanent occasion than simply erecting the obligatory sign in the local square, my narrative continued to the effect that main street, after being excavated, instead of being re-laid with tarmacadam would be surfaced with cobbles. despite my initials being appended to the end of the article, several folks actually believed that this was to be the case, going so far as to remonstrate vocally about the amount of dust that would likely invade the interior of their main street home. another acquaintance read the piece out to his wife in disgust, before telling her to forget it all on noticing the signature after the final full stop. however, there was more than just a sense of mischief in my writing, for though there are more than just a few passageways around the hallowed isle that acutely resemble several of those seen in the spring classics, both major and minor across the belgian plains, we have no cobbles; no pave whatsoever. to my mind, that is a major ommission on behalf of argyll and bute roads department, but one that i see no sign of ever being remedied in my favour. 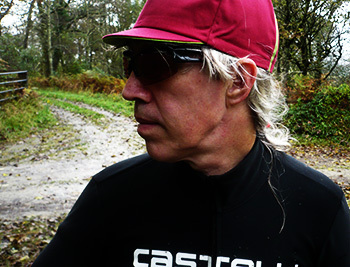 thus, the best that can be assimilated to justify the wearing of thermal armwarmers and roubaix-lined bib threequarters is my faltering emulations of sven, zdenek et all. yes, at this time of year there are doubtless many justifications for the wearing of shorts that extend below the knee; knee-warmers just don't quite cut the mustard from my point of view. galeforce winds, chilling temperatures and horizontal rain are amongst the very features that might be cited as justification, but saturday morning hurtles around the undergrowth leave no excuses in their wake. in a classics race that seems all but estranged from the northern examples, this year's milan-sanremo offered weather conditions that much of scotland takes for granted even in the summer. snow, sleet, rain and the big chill had several stars remaining in the team buses and the remainder donning every item of team clothing they'd brought with them. 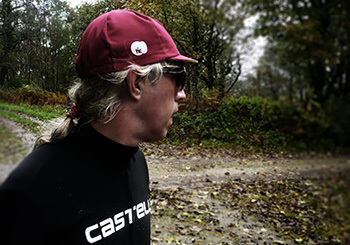 it was also a race that single-handedly acted as public-relations consultant for castelli's gabba jacket which many wore with the logos removed or hidden due to conflicting clothing sponsors. 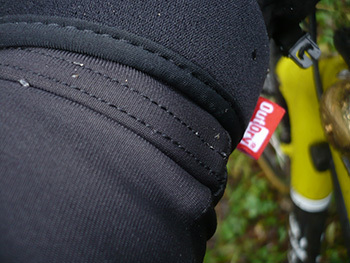 i subsequently reviewed what is a particularly superb jersey/jacket, especially when combined with the same manufacturer's nano-flex armwarmers, only to find that it did pretty much what it said on the tin. 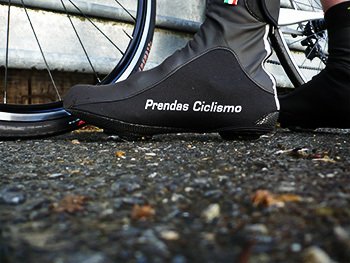 its manifest success at milan-sanremo made it a shoe-in for several whizzes round bridgend woods in late october, but this time accompanied by a pair of matching nano-flex bib-threequarters. surely the frantic actions in pouring rain of a'cross incompetent would be evened out by sartorial efficiency? it is hard to deny the apparent superficiality of admiring the cut of their jib. 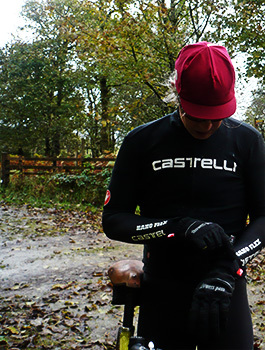 castelli's gabba jersey, armwarmers and threequarter shorts not only provided an air of professionalism, but in the inclement conditions suffered on more than one occasion, offered the equivalent of a star trek force-field. 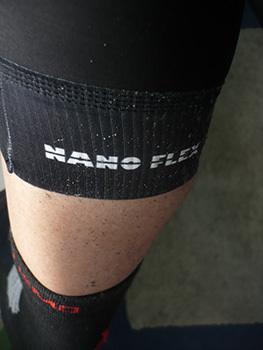 nano-flex, even according to castelli's website text is not 100% waterproof, but it does a remarkable job of keeping unwarranted precipitation at bay. and one of its immediate claims to fame is flexibility of purpose, by which i mean it is no less comfortable in mild weather than in freezing rain. however, its most notable aspect might well seem totally contradictory to spending any money on them in the first place; if you didn't look down every once in a while, you'd never know they were there. no doubt this sounds like hyperbole, but in truth these are amongst the finest shorts/bibknickers it has been my good fortune to wear. 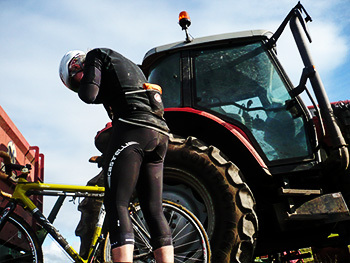 my mounting and dismounting skills when related to cyclocross may be amongst the funniest sights you've ever seen, but neither one nor t'other were in any way hindered by the castellis, and that includes the kiss3 pad. 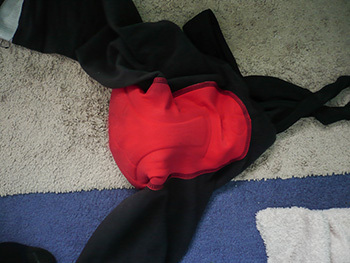 that, if i might be so bold, is castelli's secret weapon. 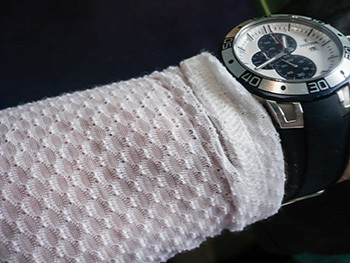 the mesh bib straps conform to the more usual race-fit posture; they feel a tad awkward when standing about slurping coffee, but offer the ideal anatomic position when tightly grasping the drops while the bicycle hurtles ever nearer to ruddy great trees and a wooden fence. the hems are merely paper thin but daubed with silicon gloop on their inner face to prevent riding up during excessively athletic prowess. their flexibility has truly to be experienced to be believed, and despite substantial quantities of sticky grit plastered over my backside (the true professional would never consider a crudguard over the back wheel. me neither.) and all over the bit i suppose we might refer to as the threequarter, the bulk of these misdemeanours was easily brushed aside. black may not be motorised traffic's favourite colour these days, but it's a very black black, accented with several reflective bits and bobs. these really are very, very good, and i swear i was a kilometre or two faster than usual (though i could be mistaken about that bit.) and just so that we're not living under any misapprehensions here, they are every bit as good on crumbly roads, especially the ones that look like they've been borrowed from belgium. 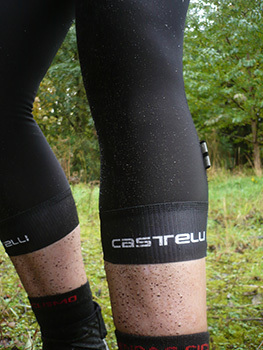 the stunning part about castelli's nano-flex bib knicker, apart from the fit, the weatherproofing and the comfort, is the price. at £95, impressive would be something of an understatement. available in black only, they can be had in sizes small (reviewed) all the way up to xxxl. 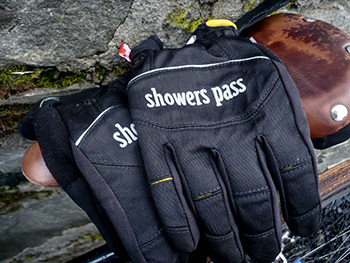 showers pass crosspoint outdry softshell gloves cost approximately £59 in the uk ($80 in the usa) and are availabe from a variety of cycle retailers across the uk. if i were the sort of chap who was surreptitious in his nefariousness, i'd be inclined to keep my face shut and give the impression i live permanently in the moment. not once, i would contend, have i been guilty of referencing past successes (such as they are), being so on the ball, that ideas perennially circulate in my psyche, just waiting to be picked off each day and converted to black and yellow pixels. but that's not the sort of bloke i am, more's the pity. i feel compelled to admit to the occasional reprise, to having the contemporary informed by a select period in history. quite some number of years ago, i contributed an article to a prominent drumming and percussion magazine. would that it were some form of impressive review concerning a top of the range and disturbingly expensive drumset, but sadly, it was merely my ruminations on a hitherto undiscovered aspect of percussive mentality. ok, so that's maybe overstating the case, but i wrote words about drumming anyway. without boring you with details you're less than interested in, the gist of my theory concerned the drawing of a white line (bear with me, it gets worse). this can be done in one of two ways: simply draw a white line on a black piece of paper, or fill in every square inch of a white sheet of paper, leaving only a white line of the desired thickness. don't worry, i am saying all this correctly, it's just that, as usual, i've yet to come to the point. 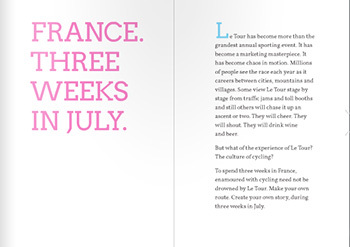 those three weeks in july become more and more important to more and more people each year, begetting a self-fulfilling prophecy that sees the tour de france become distanced from the other two grand tours in terms of perceived importance and grandiosity. though several of us agree that the giro d'italia provides both spectator and rider with arguably better racing, le tour still holds court over its siblings with seeming impunity. while that may be manna from heaven for a rising number of aficionados, it also provides tangible subject matter for those willing to look outside the peloton. those are the folks who would describe the white line by colouring in the rest of the paper. photographer ian walton is undoubtedly one of those folks, while designer paul wood has a sympathetic handle on how to help ian by appearing to keep out of the way. 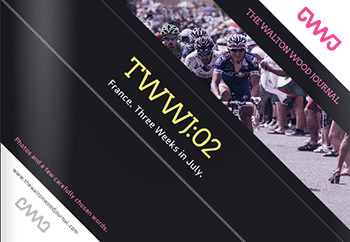 with the waltonwood journal issue one, both talented fellows hit the ground running; the commendable ease with which they portrayed this year's volta catalunya would have convinced even the naysayers that here was a partnership that would have had to be invented had it not already existed. 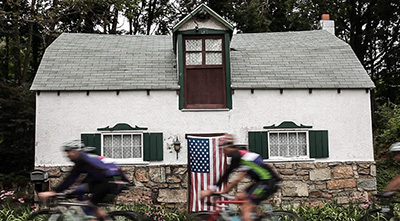 and while many would emulate the neo pro by investigating lesser races before attempting the tour, their audacity is not only admirable but to be commended for the manner in which they have approached the planet's biggest bicycle race. though the accuracy of my statement is open to debate, this is a photo book that has ignored the race completely. well, sort of. let's face it, it has to be pretty hard spending the bulk of july in france following the tour with camera in hand, yet returning home with very few images of bicycles and those who ride them. viewed in a detached manner, you'd rather wonder whether mr walton was the best choice for a press pass. but like many a major event, there's an entourage, an ambience, a periphery that exists as a result of the principal. these, surely, deserve if not the same attention as the race, certainly a heavily weighted proportion. in the manner that drummer jim keltner stated he'd to find a niche amongst the wunderkind of the drumming world with their rudiment a second in odd time signatures, by keeping it simple, it is hard not to applaud the waltonwood journal for deliberately missing the obvious. 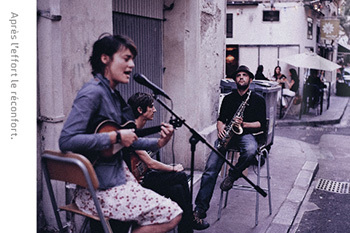 two guys on a bike, one sat on the handlebars; a gendarme handing a souvenir to a spectator; street musicians in a french side srteet and an eponymous norbert dentressangle truck flanked by sunkissed spectators. these are every bit as much a part of the tour de france as mark cavendish sprinting to victory, the glass of champagne on the last stage and more red skodas than you can shake a giant green pmu hand at. a bit like trying manfully not to play a paradiddle where it is least required, it can't have been easy to ignore a speeding and alarmingly colourful peloton in favour of france's fringe. but believe me, it was worth it. paul wood has reprised the style and layout of issue one, pragmatically so, for it displays walton's images to their best advantage by consciously remaining the silent partner. a bit like ignoring le tour, this too requires nerves of steel. designers enjoy a bit of adulation too you know. issue two of the waltonwood journal can be viewed online via the dedicated website, but thanks to sponsors look mum no hands, kinoko cycles, colourbolt, pave and blackforest beers, there are also 316 physical copies available for grubby little paws to manhandle. if i might point out that issue one used only enough ink and paper for forty copies, it seems we may be celebrating the beginning of a success story here. view it online if print does not reach places near you, but i'd heartily recommend paper and ink; it'll fill that extra space in the musette. "You can feel what you feel about the ride and know what you know about the ride and ride the ride you ride, and who are we to say you should or should not?" it is not, contrary to popular opinion, written in stone. it may be bonded in carbon fibre, hydroformed in aluminium or even engraved in steel, but set in stone? not a chance. it's all to do with subjectivity, the fact that each and every ride means something different to individual members of the pelotonese. given the strength of human nature, it could hardly be any other way. therefore it is outwith the bounds of consideration that the early morning meet-up of a sunday morning is not the singular event attested to in the notice on the cafe wall. though the enjoyment is surely endured across those miles or kilometres that form the filling in the sandwich, only one can cross the sprint line in front. 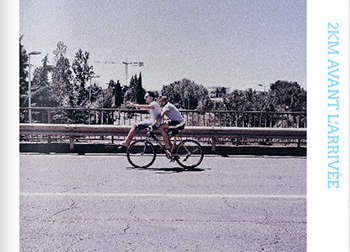 those who tried and failed will have less fond memories of the conclusion than will the velocipedinist crossing with arms at least metaphorically in the air. placed in an existential frame such as this, the ride suddenly seems far less coherent than its singular purpose would appear to define. but that, dear readers, is not solely applicable to the bike ride; it is also applicable to lesser walks of life. 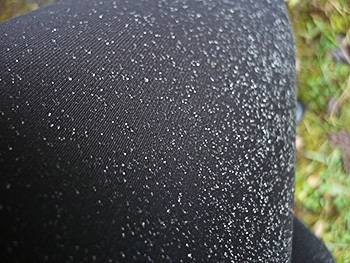 (that these form less important strains can be noted from the use of the word 'walks'). however, in order to appreciate the whole enchilada, so to speak, we must be prepared to take the rough with the smooth. 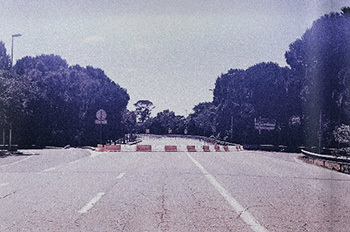 that mid-ride hurricane, the odd deluge and the puncture that sneaks up unannounced ought truthfully to be appreciated on an equal level with several kilometres of unfettered descending, a galeforce tailwind or a large cup of serious froth at ride's end. the comparison with chiarascuro cannot be overstated; in order that the highs be appreciated for what they are, the lows must place them in context. how else are we to grow as human beings? however the dichotomy of purpose still pervades from beginning to end. 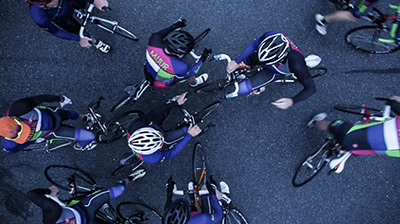 though having convened for the sole purpose of a group ride, there will always be those with the ability or desire to be at least several lengths to the good. and despite a willingness on behalf of those otherwise occupied to allow a satisfactory yet tenuous day in the sun, the pride and joy of their yin to others' yang must surely allow for the thrill of the chase. 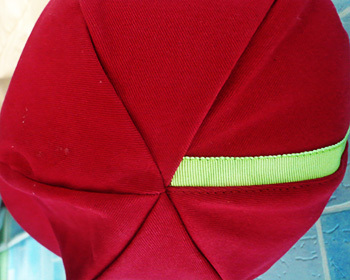 while forming a constituent part of the breakaway, a sense of purpose may also inform the inseguitori, allowing contrary objectives to complement each other. in hindsight it can be seen to have always been this way. the epitome of pain and suffering, both noble and ignoble, has been truly encapsulated in activity such as the sunday ride. group mentality often dictates that one should strain not to lose face when adversity knocks on the door. for rest assured that there will be comments, assertions and insinuation over coffee and cake, yet that the peloton is all together at this point surely underlines that the insufferable is endurable. who would have guessed? 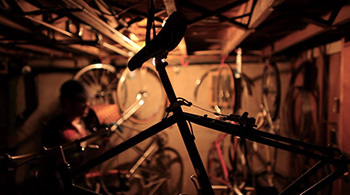 ultimately, however, as it is writtten in the velo club rules, 'the sunday ride is the sunday ride.' it cannot ever be otherwise. for no matter how i/we might intellectualise the process, breaking it down into its seeming constituent parts is ultimately a redundant exercise. as one with greater perspicacity than i has put down in print "...we can never know really what we are riding for and, not caring, we ride, and we ride and ride and ride, for no reason other than to ride." it's the way we roll. this past weekend, the uci cyclocross season started with live streaming of the race from valkenburg on, of all things, youtube. who knew you could offer live streaming via that video platform? i'd always figured it was only for movies of cats on vacuum cleaners. anyway, the one feature that hasn't altered very much is the opportunity to post comments, except to accompany the live streaming, these too were being rotated in real time. it has never ceased to amaze and amuse that each youtube video features a list of comments below, and by the time you reach the fifth posting, there are at least two guys (it's always guys) arguing and name-calling about something several stages removed from the subject of the video. in this case, the race was won by rabobank's lars van der haar, apparently not only the first time he'd won a race of at this level, but the first time a european 'cross race has been won on a disc equipped bicycle. and that, in a nutshell, seemed to be the principal subject of discussion in the sidebar. of course, since uci racing is international, many of the comments were in languages foreign to me, so it's highly possible that some of the conversations were of a more intelligent nature, but there's every likelihood that the argument of 'yes they are, no they aren't' will continue well past its sell-by date. personally, i still place my faith in cantilevers, and i certainly have no truck with disc brakes on road bikes, but on the basis of one or two review models, i cannot deny that discs do precisely what they set out to do. however, i'm just not sure it's all entirely necessary other than on the basis of selling container loads of new frames to folks already well-equipped with bicycles in the bikeshed. still, that's marketing for you. but all those commenting on the efficacy of one or t'other, based on little more than conjecture seem to be largely missing a feature that impacts far more on the sport, or at least its aftermath that could conceivably make the difference between being let out on a saturday morning or not. 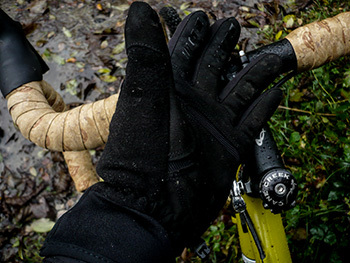 one need only settle down to watch the spring classics (not that long to go now) to note that each and every team, when faced with inclement weather, clothes the riders in legwarmers or tights, armwarmers, jackets and perchance the odd winter hat. and in order to keep those little tootsies away from the spray chucked up by a blatant lack of mudguards and from passing team cars, most if not all are seen wearing overshoes. but it would be a foolish individual that contended cyclocross racing was not far more onerous in this respect than any rain affected road classic. 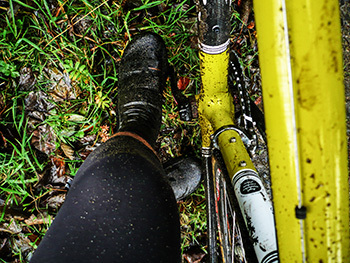 frequently strewn with gloopy mud, deep puddles and yukky sand, the average cyclocross race cannot be considered too kind not only to brightly coloured footwear, but the feet contained within. and in case you wonder why this should have any bearing on being let out to play of a weekend, after a through soaking on the 'cross bike last saturday, had i left muddy footprints on the kitchen floor, mrs washingmachinepost would have undoubtedly rescinded all cycling privileges for an indeterminate period. 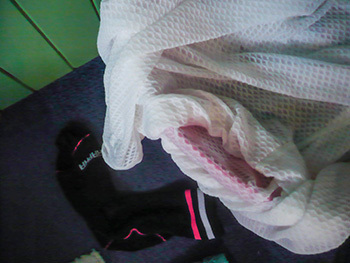 however, forethought is fore-armed (or words to that effect), and i had covered my dmt offroad shoes with a pair of prendas aquatex overshoes, light of constitution, but heavy on the weather protection. 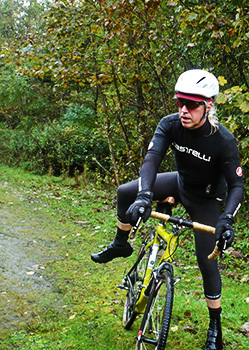 unlike road racing, cyclocross involves a fair amount of running. though american courses seem to feature hurdles that can be bunny-hopped by the more agile, european races involve ruddy great hills and sets of step over which there is less option. 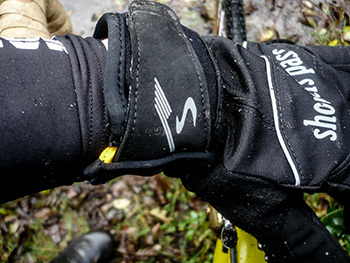 thus, the sole of the average overshoe may have much in the way of pain and suffering inflicted, and riders such as sven nys may be rather circumspect in having flailing bits of neoprene or, in this case, aquatex dragging around behind them, particularly when attempting to clip in after re-mounting. i cannot, i must admit, compete with the likes of nys; if i could i would not be sat in front of my macbook air typing this. 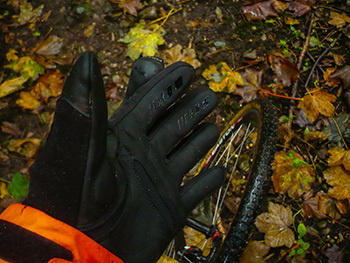 but in the course of riding the wrong way round bridgend woods, pausing only to fall off once in a while, there was much in the way of footwork involved (some of it involuntary), yet i noted barely a scuff mark on the soles of the aquatex overshoes. 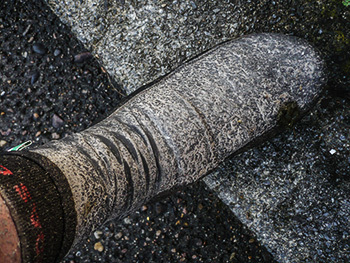 with variety being the spice of velocipedinal activity, i of course took an appropriate amount of time to ride the road; there are variations in cleat size to be considered to say little of the difference in sole pattern and bulk between the two variants of footwear. in both sets of circumstances, the notable plus point, aside from a seeming imperviousness to the worst of the precipitation and mud, is not only a lack of initial weight, but a keenness to avoid absorbing any moisture that might upset that particular apple cart. therefore, after several hours of making a prat of myself on a cyclocross bike, 'twas simplicity itself to peel them off on the back step of the croft and enter the kitchen without fear of repression. to prove my point, i was allowed out next day. 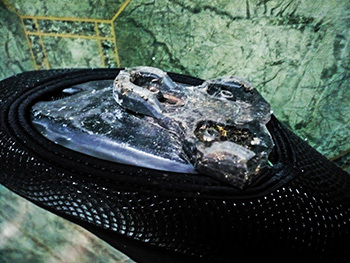 the zip at the rear is a dawdle to open and close, and the stretchiness of the aquatex fabric is flexible enough to accept pretty much any style of cycling shoe, irrespective of the shoe closure method employed. but the best bit is the price. 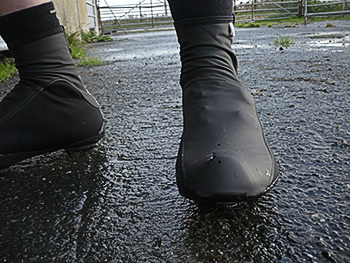 only £29.95 for overshoes that love the road as much as the undergrowth, and in four sizes (41 all the way to 50) seemingly studiously impervious to any incoming irritants, is definitely not to be sneezed at.